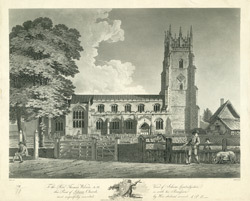 View of St Andrews, the parish church of Soham in Cambridgeshire. This is a late 12th century church, built in a cruciform shape. Since then, it has had many alterations of a later date including chancel, too chapels, aisles, porches, and an impressive embattled tower with pinnacles and clock.